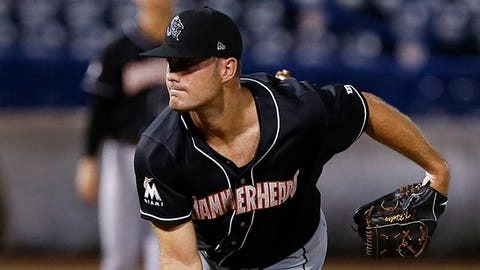 The Minnesota Twins added right-handed pitcher Tyler Kinley from the Miami Marlins in the Rule 5 draft Thursday morning. Kinley, who was drafted in the 16th round by Miami in 2013, split time between Single-A Jupiter and Double-A Jacksonville in the Marlins organization last season. He finished the year with a combined 2-3 record with a 3.54 ERA and 72 strikeouts in 53 1/3 innings pitched. Kinley is the ninth player the Twins have selected in the Rule 5 draft since 2005. Recent picks include Justin Haley (2016), J.R. Graham (2014) and Ryan Pressly (2012). Players must be kept on the 40-man roster all season and cannot be sent to the minors or traded. If placed on the disabled list, they must be on the active roster for at least 90 days. If a player is to be taken off the 25-man roster, he must be offered back to the team they were drafted from for half the cost ($50,000) for drafting them. The Twins lost two prospects in the Rule 5 draft — right-handed pitchers Nick Burdi (third overall) and Luke Bard (12th) were selected by the Philadelphia Phillies and Los Angeles Angels. Burdi was a second-round pick in 2014 by the Twins. He pitched just 17 innings at Double-A Chattanooga last season, as he had Tommy John surgery in May. After the draft, Burdi was traded from Philadelphia to the Pittsburgh Pirates. Bard pitched for Double-A Chattanooga and Triple-A Rochester last year, combining for a 4-3 record and 2.76 ERA in 41 relief appearances. He fanned 99 hitters and walked just 24. As winter meetings come to a close, the Twins now have 38 players on their 40-man roster.